Sean Gerold grew up seven blocks from Byron P. Hollett Little Giant Stadium. As a boy, he says he could hear the Monon Bell ring off in the distance and hear the sounds of the huge crowd when there were big plays. But he never attended a game until he became a football recruit for Wabash College. 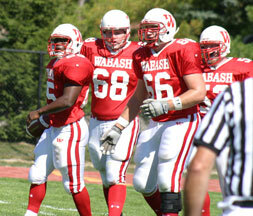 "Since I was a little kid I wanted to go to Wabash," the 6-4, 280-pound offensive lineman says. "I wasn’t sure if I would be good enough to play football, but I sure wanted to go to Wabash." He came to Wabash as a tall, somewhat slow tight end out of Crawfordsville High School. He overcame some injuries, hit the weights, and was moved to the offensive line. His dreams of attending Wabash and playing football had come true. By his sophomore year, he was a mainstay on the Little Giant team that went 12-1 and advanced through the Division III playoff quarterfinals. He was a long snapper and backup tackle on that team, and earned his first collegiate start in the playoff loss to eventual national champ Mount Union. In 2003, he was a regular on the offensive line. (Photo above shows Gerold, number 66, celebrating a TD with Aaron Lafitte.) He was proud to earn a start in the Monon Bell Classic. "Getting to start in last year’s Bell Game was awesome," he said. "Winning the game was great; winning on DePauw’s field and knowing that I played a part in it was just incredible." Sean, whose father, Gregg, died when he was a senior in high school, had become a walking, living example of "local boy doing well" at Wabash. Gerold even earned a couple of letters as a thrower on Coach Rob Johnson’s track and field team and is pursuing a history major. He approached his senior season of 2004 with vigor. He worked out religiously and was the unit leader of a young, but experienced offensive line. Then, in training camp, he got the news that his career was over. A significant lower back injury made it too dangerous for him to continue to play. Doctors told him that if he continued to play he could risk a potentially devastating injury. "It was just a major bummer when we found out Sean couldn’t play," said Coach Chris Creighton, who recruited Sean and was amazed at his development as a person and a player. "He’s handled the situation about as well as any player could," says the coach. Instead of running off to hide, Gerold recommitted himself and approached the coaching staff about the possibility of serving as a student assistant coach. The coaches were thrilled to have him. "Sean has gone above and beyond what we imagined," said Creighton. "He’s not an injured guy just trying to help out here and there and stay a part of the program. He’s been with us all year and he plays a major role on this team. "I certainly hope it’s been a valuable experience for him." In Saturday’s 111th Monon Bell Classic, Gerold will be on the sidelines wearing his jersey number 66. He’ll keep the players focused and continue to work with offensive line coach Mark Jozwiak. Even if he can’t be a part of the actual game, he is committed to helping send the seniors out with a win. "Having the opportunity to coach has been great preparation for me since I want to someday become a teacher and coach," says Gerold. "Coach Creighton just means so much to me. He’s brought me into the coaching staff as an equal. I can’t say enough about what he means to me." Sean Gerold would certainly rather start on the field against DePauw’s Tigers this weekend. But he’s confident in his accomplishments and focused on being a positive role model for younger players. And what a good example he has been.